The brightly colored mural in A.W. Smith depicts the faces of six women, interspersed with chemical engineering jokes and equations. A hallway in the A.W. Smith Building recently made local news and is about to look very different. What could have been the story of media overreaction and the stifling of dialogue has instead turned into an opportunity for collaboration. 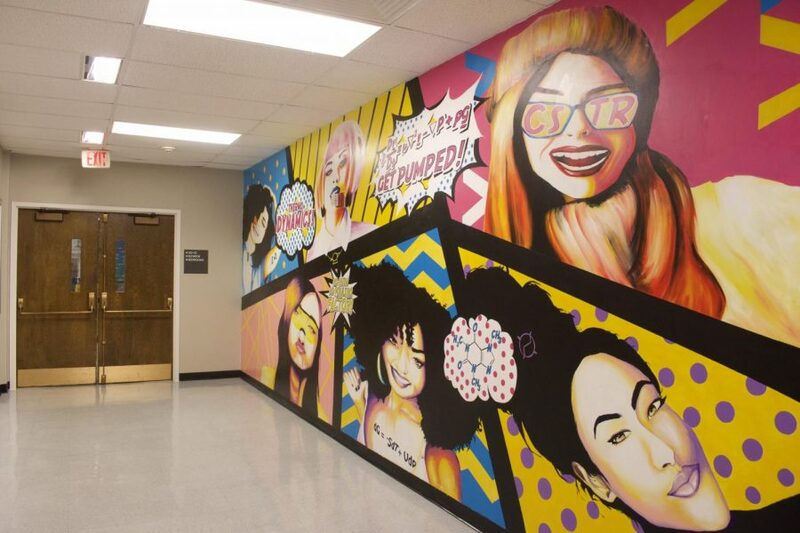 The hallway features a mural depicting the faces of six women in vibrant colors, sprinkled with chemical engineering-related phrases and equations. Its original purpose was to brighten up the building’s interior by celebrating women in engineering. Due to student objections, the mural will be painted over. Local news coverage of the mural’s removal criticized Case Western Reserve University for refusing to reveal the specific nature of these objections. Individuals may have been afraid to come forward to The Observer because of the potential repercussions of publicly objecting to the mural. We think this criticism from local news was unfair, and we encourage members of our community to look at the mural and ask themselves why some may have found it problematic. Some may enjoy the mural for its bright colors or for its message, and others may disagree with its representation of female engineers. Whatever your opinion, you can make an effort to see and respect opposing viewpoints and try to put yourself in others’ shoes. Ultimately, though, we think it’s unproductive to continue to dwell on the objections or to criticize the students who want the mural removed. As the community works to move forward, the Editorial Board wants to highlight what various members of our campus community are doing to solve this problem. The solution began with a discussion. The Flora Stone Mather Center for Women brought students’ concerns to chemical engineering department chair David Lacks, who originally commissioned the painting of the mural. A decision was made to rotate the mural approximately every two years. While the specifics of the plan are still in the works, the new mural selection will involve the feedback of Lisa Nielson, the Director of the Women’s Center, and a student committee. We think that the response from Lacks and the Mather Center embodies our community’s dedication to dialogue and student feedback. Despite outside pressure of various origins to not replace the mural, they were willing to discuss the problem and work on a solution. In the past year, we have seen many efforts at CWRU to include more student feedback. When students expressed concern about the timeliness and depth of safety alerts last spring, Undergraduate Student Government worked with the Department of Public Safety to improve the thoroughness of alerts. The Commission for the Undergraduate Experience has also responded well to student concerns and suggestions and made a strong effort to improve student life at CWRU through the release of a Preliminary Recommendations Report. “Dialogue” might be a vague term that’s become popular in the media. But this academic year, we have seen it take a stronger shape at CWRU. It has become a cornerstone of our campus’s response to controversies. It’s through conversation that we’ve been able to pinpoint issues on our campus and create resolutions.